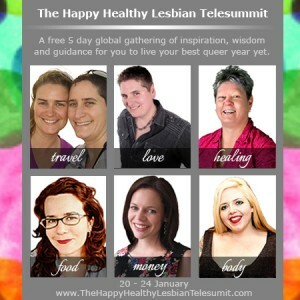 My new friend and colleague, Amy McDonald, invited me to participate in the first ever Happy, Healthy Lesbian Telesummit. For those of you who have never participated in a telesummit before, basically it’s an online “event” (meaning, a limited period of time) where you can listen to live or recorded presentations or conversations with moderators. I went deep down the rabbit hole of woo and self-development at the first Hay House World Summit last year. This one is next week! January 20-24! She’s also talking to my health coach Victoria from Heart Beets Holistic, my newly minted relationship coach (more on that journey in a blog post later this week) Christine Dunn-Cunningham of the Lesbian Love Guru, and my friend Dawn Kirby who taught me about tapping! She’s launching a business to help women heal from sexual trauma. You can register for the summit here. You’ll get emails each day of the Summit with the days’ available conversation to download! 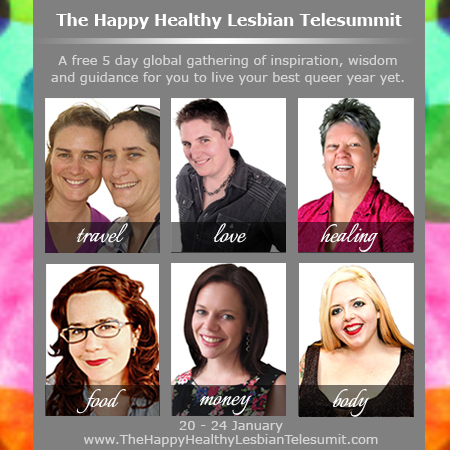 Amy will be speaking with lesbians and queer women from Canada, the USA, Thailand, and Australia, sharing wise woman wisdom about how we can all be happier and healthier this year. 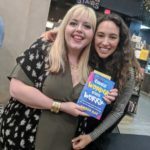 Together we’ll share our favorite tips and techniques of happy and healthy bodies, relationships, money, food and nutrition, travel and spirit. All by queer women for queer women. Registration is free and easy. 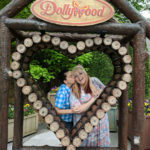 AND by registering you’ll also be able to access loads of free gifts from me and Amy’s other guests, including teleclasses, e-books and more. I’m really excited about this event. I hope you can join in the fun! Hey Bevin! I can’t wait to share our chat with everyone next week. Hooray for Happy Healthy Lesbians! Curve Magazine did a feature article about me that is published in the May issue! The issue has Beth Ditto on the cover! 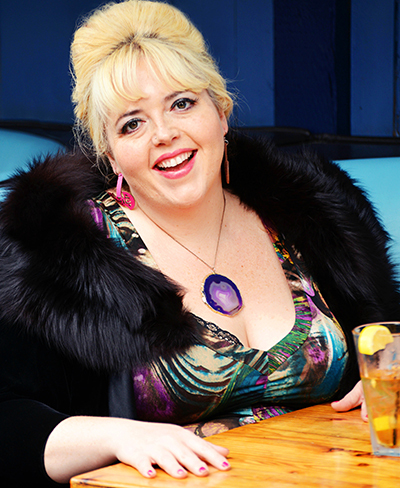 I'm so stoked to be included in the Body Positive issue and with company as incredible as Beth Ditto.